Killed in action 1st July, 1916, aged 20.1/5th Battalion, The South Staffordshire Regiment. One of seven Leek men to die on the first day of the Battle of the Somme, the worst single day for the town in terms of casualties in any war. Harry Billing was the eldest of five children and the son of a senior executive at the Leek and Moorlands Building Society (now Britannia). The family lived in a large house in Buxton Road and Harry worked at Parr’s bank, St. Edward Street (now Bank House). Harry is commemorated on the Thiepval Memorial to the Missing, Somme, France. The memorial displays the names of some 75,000 officers and men who fell on the fields of the Somme between 1916 and 1918 and who have no known grave. After nearly two years of stalemate in the trenches, the Battle of the Somme was meant to be the ‘Big Push’ that would break through the German lines and relieve pressure on the French who were fighting at Verdun. As the British troops, most of them going into battle for the first time and many of them belonging to Kitchener’s ‘Citizen’ Army, climbed out of their trenches and walked towards the enemy lines, the defending Germans unleashed a hail of shells and machine gun bullets, mowing down the advancing soldiers in their thousands. 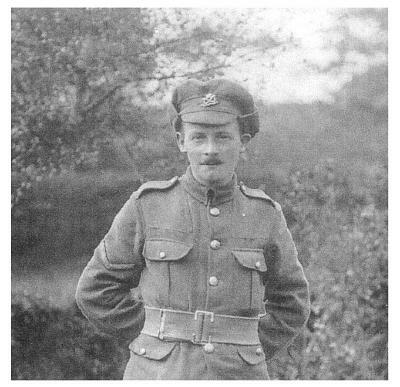 Harry Billing was one of nearly 20,000 men killed that sunny morning, the worst day in the history of the British Army. His body was never found or identified. Harry belonged to the South Staffordshire Regiment, who along with the North Staffordshire Regiment were to advance near Gommecourt as part of the 46th Division. The attacks by the 46th and 56th Territorial Divisions were to be a diversionary attack for the main 4th Army further south. The 46th (North Midland) Division initial attack was repulsed by deeply dug in Germans (who had suffered a seven day bombardment which had little effect on the Germans or the barbed wire of no mans land) and the commanding officer General Stuart-Wortley was ordered to renew the attack. With no prospect of success Stuart-Wortley ordered only a token second attack. After the offensive he was sacked and the 46th Division was categorised as showing “lack of offensive spirit”. The dead of the 6th Battalions of the North and South Staffords lay out in the open by Gommecourt Woods for another 8 months until March 1917, when the Division returned and the Germans retreated to the Hindenburg Line. The Battle of the Somme ground on until the November rains forced both sides to call a halt. The British Army had by then only advanced some seven miles into enemy-held territory. The Divisions reputation was reforged in 1918 when it crossed the St-Quentin Canal and broke through the Hindenberg Line.